Sunflowers seeds might well become one of your pantry staples and a regular part of your diet once you become aware of their many health benefits. 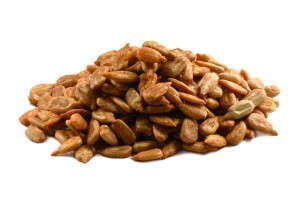 Sunflower seeds can help prevent cardiovascular disease and reduce the risk of strokes and heart attack. 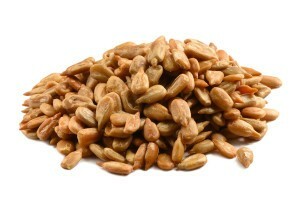 Sunflowers seeds provide selenium which is reported to reduce the risk of cancer. Due to their high magnesium content, these seeds can help lower blood pressure and cholesterol and reduce the occurrence of headaches and eliminate muscle soreness and fatigue. Sunflower seeds can help reduce the development of diabetes and can assist with balancing blood sugar levels. When you’re enjoying a handful of these tiny, crunchy seeds, you’re helping protect and boost your brain, heart, thyroid, muscles, bones and skin. If you find yourself feeling a little down, adding sunflower seeds to your diet may lift your mood. This is due to the beneficial magnesium the seeds contain. Inflammation is a problem many Americans are experiencing. Inflammation can lead to numerous diseases such as heart disease, diabetes, cancer, Alzheimer’s and Parkinson’s disease. Eating a ¼ cup serving of sunflower seeds will provide you with 80% of the recommended daily amount of vitamin E. Getting a high percentage of vitamin E in your diet can help reduce whole body inflammation thereby preventing the development of the previously mentioned inflammation-related diseases. When you discover how amazingly beneficial sunflower seeds can be for your heart, you’ll likely want to make sunflower seeds bulk purchases on a regular basis. This will open up a wealth of opportunities for you to enjoy sunflower seeds as a tasty snack and to use them as a way to boost the nutritional benefits of many recipes. 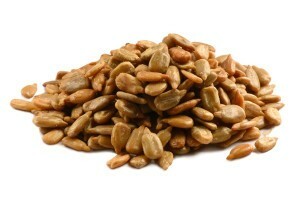 Studies show that sunflower seeds can help balance cholesterol levels. Too much cholesterol in your body is a contributing factor for heart disease. Sunflower seeds are a cholesterol free food. High blood pressure is a risk factor for heart disease. Sunflower seeds contain healthy monounsaturated and polyunsaturated fats which have been shown to lower blood pressure and reduce your risk of cardiovascular disease. 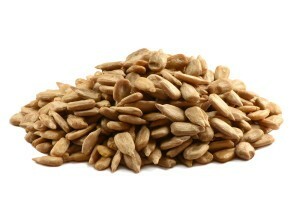 Sunflower seeds are an excellent source of vitamin E. Vitamin E is attributed with reducing the risk of heart disease. Sunflower seeds also contain the nutrients Folate, thiamin, niacin and iron and phytochemicals that protect against many types of heart disease. Studies show that over 25 million Americans suffer from thyroid disease. A deficiency in selenium is a leading cause of thyroid disorders such as hypothyroidism and hyperthyroidism. Because of the many roles the thyroid gland plays in your body, thyroid disorders can manifest themselves in various ways. Weight gain, fatigue and abnormal body temperature can all be associated with an improperly functioning thyroid. Including sunflower seeds in your diet is a fantastic way to increase the amount of selenium in your diet and in turn, provide support for your thyroid. 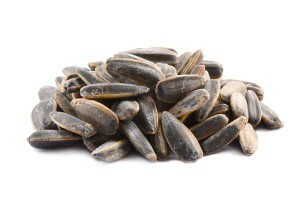 In 100g of sunflower seeds, there is 96% of the recommended daily allowance of selenium. The dietary habits of most Americans do not include the amount of nutritionally-rich foods that are necessary to acquire a sufficient amount of vitamins and minerals. One of the minerals that Americans tend to be deficient in is magnesium. Magnesium is needed to help maintain the proper balance of calcium and potassium in the body and to protect against a reduction in bone mineral density. Bone loss can lead to osteoporosis, a disease which can have life-altering repercussions. Magnesium also helps regulate muscle tone. 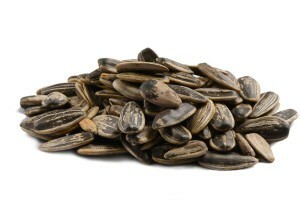 Sunflower seeds are a good source of the vitamin B5. Vitamin B5 plays a significant role in regulating hormones, maintaining healthy brain function and in synthesizing fat. If you have just a minimal deficiency in vitamin B5, you may experience muscle cramps. A great way to get the amount of magnesium and vitamin B5 that your body needs to prevent osteoporosis and muscle cramps is to buy sunflower seeds wholesale in large quantity so that you can make them a regular part of your diet. If you’re concerned with achieving and maintaining healthy skin and hair, you might want to grab a handful of sunflowers seeds for a snack or add them to your trail mix, granola or other recipes. Sunflower seeds are a good source of vitamin E. Research shows that vitamin E plays a significant role in helping skin retain a youthful appearance, even as we age. Sunflower seeds are also a good source of copper. The body uses copper to make melanin. Melanin molecules help protect the skin from the sun’s damaging ultraviolet rays. Eating just one ounce of sunflowers seeds can provide you with a beneficial amount of copper.